Many home owners neglect to wash their home regularly, which allows contamination, dirt, mold, and mildew to become ingrained into the siding of the property, which not only impacts the house’s beauty and curb appeal but also devalues the property and destroys its exterior. House washing is considered the lowest-cost home improvement project with the highest return on investment. Puma Power Wash has the perfect solution to protect and even increase the value of your property, with our fast and affordable house-washing system. Our highly experienced and certified technicians are experts in house washing, including the removal of dirt, mold, mildew, and other contaminants, using the application of biodegradable cleaners, soft brush scrubs, and final steps that include double wash with fresh water. Our unique house-washing system applies to any type of siding, including vinyl, brick, wood, stucco, aluminum, and more. Puma Power Wash has the solution to extend the life of your roof and restore its beauty. Our certified technicians will apply Algaecide to the roof twice—the first application to neutralize the unsightly algae and the second to make sure it all has been eliminated. 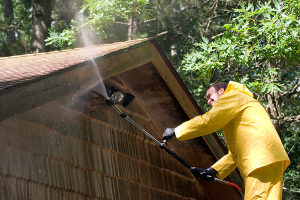 Puma Power Wash uses only safe, low-pressure roof cleaning in the process. Puma Power Wash has the solution to restore and prevent your gutter from getting clogged; our certified technicians will clean the gutter, apply gutter brightener, double brush, and finally wash with fresh water. This process will release the bonds and will remove all contaminants. Our gutter-cleaning process is fast, safe, cost effective, and a great way to maintain the value and look of your property. Call us today for a free onsite estimate at 415-825-2559. Environmentally friendly and safe—let us bring back the beauty and curb appeal to your home, roof, and exterior.